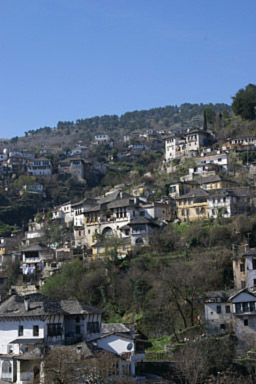 View of 'Partizani' quarter in Gjirokastra. Gjirokastra is situated in the Drino valley which lies between the dramatic Lunxheria mountain range to the east and Mount Gjerë to the west. It has a population of 35,000, and is the economic and administrative centre for the Gjirokastra District, which includes the town of Libohovë and communes of Antigone, Lower Dropulli, Upper Dropulli, Lazarat, Lunxhëri, Odrie, Picar, Pogon, Qendër Libohovë, and Zagori. The majority of Gjirokastrans are ethnic Albanians with a minority of Greeks, as well as small communities of Vlachs and Romas.